Emanuel Ungaro worked together with Balenciaga and Andre Courreges and for that alone deserves the utmost respect. La Maison Ungaro not leave your best moments. Since the famous couturier left his home many designers have gone for it as Giambattista Valli, Giles Deacon and Jeanne Labib-now Lamour, they all seek the brand is reborn from its ashes. 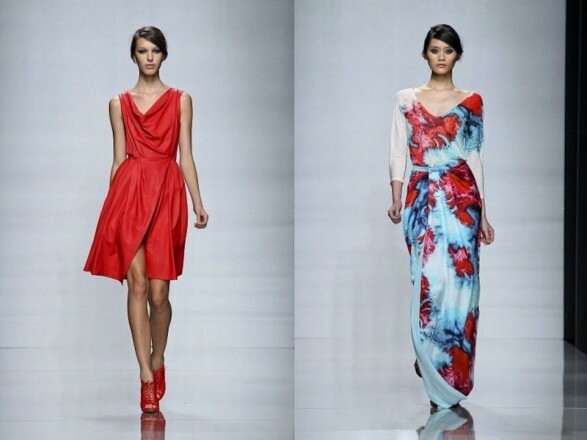 The Spring-Summer Collection 2012 is a small step in the resurrection of the Maison Ungaro. Faded prints in blue tones predominate throughout the collection. The blues is mixed with red in form an attractive palette. The simplicity of strength gains some dressed in red. Breathing patterns reminiscent of 90s even with a touch of the eighties. Earth tones are white for evening gowns or party. Even a bright flash is from a collection restrained.